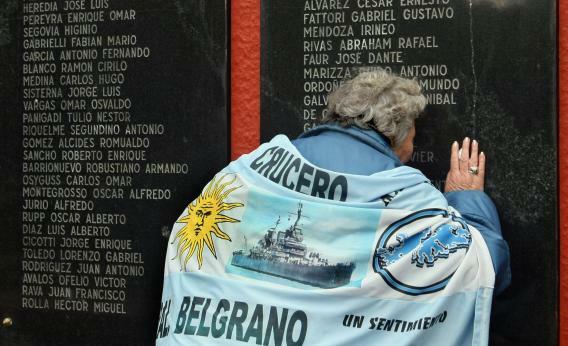 The mother of an Argentine sailor killed in the sinking of the cruiser Belgrano in 1982 mourning at the Buenos Aires memorial on the 25th anniversary in 2007. Imagine, for a moment, the Admiralty’s nightmare scenario: in the not-too-distant future, a nearly bankrupt Argentine government invades the oil-rich Falkland Islands. For the second time in half a century,Las Malvinas—the islands of Latin America regarded as a stolen piece of Argentina—spark a war meant to divert public attention from the Argentine government’s economic failings. With twenty-first century budget cuts biting hard, Britain has no aircraft carrier. Argentina retired its own carrier in the late 1960s. Yet, unlike 1982, when Margaret Thatcher dispatched a flotilla to retake the islands, this time the South Atlantic is anything but empty. It’s home to a Brazilian carrier, the São Paulo, along with a fleet of nuclear-powered attack submarines being built in partnership with Argentina. (Read more at Prospect magazine).